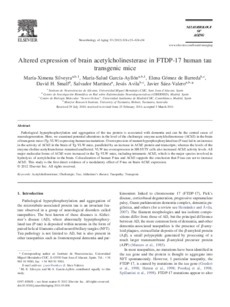 Pathological hyperphosphorylation and aggregation of the tau protein is associated with dementia and can be the central cause of neurodegeneration. Here, we examined potential alterations in the level of the cholinergic enzyme acetylcholinesterase (AChE) in the brain of transgenic mice (Tg-VLW) expressing human tau mutations. Overexpression of mutant hyperphosphorylated tau (P-tau) led to an increase in the activity of AChE in the brain of Tg-VLW mice, paralleled by an increase in AChE protein and transcripts; whereas the levels of the enzyme choline acetyltransferase remained unaffected. VLW tau overexpression in SH-SY5Y cells also increased AChE activity levels. All major molecular forms of AChE were increased in the Tg-VLW mice, including tetrameric AChE, which is the major species involved in hydrolysis of acetylcholine in the brain. Colocalization of human P-tau and AChE supports the conclusion that P-tau can act to increase AChE. This study is the first direct evidence of a modulatory effect of P-tau on brain AChE expression.